Travertine is a natural sedimentary limestone that is notable by its porous holes that can be finished for a smooth surface or left untouched for a rustic look. Travertine comes in many different varieties such as pavers, tiles, copings, and mosaics and in a range of colors and patterns. Most stone distributors and wholesalers in the United States get their travertine from quarries in Turkey – Texas Travertine is no exception. But there are also several quarries in Iran, Mexico, Italy, and Peru, although the quality and color range, depending on the location. There are several natural rock formations compromised of travertine in the United States such as Yellow Stone National Park, Hamilton Pool in Austin, and there are even two parks dedicated to the material in Oklahoma: Turner Falls and Honey Creek. Although, travertine can be found in the United States, these parks and natural wonders will remain preserved without the interference of drills. Where does Texas Travertine get its travertine? At Texas Travertine we have direct communication with our 13 quarries in Turkey. We usually get shipments of travertine once daily from the quarry directly. The travertine is shipped in a large cargo container and then shipped by boat straight to the Port of Houston. We store it at our facility and then deliver it by truck to you for your project. Who are Texas Travertine customers? Travertine can be used for projects big and small; therefore, we do not limit the quantity and amount of travertine we sell. Architects, contractors, builders, and individuals are our main clientele. Anyone can buy our travertine materials no matter the project or design! Travertine pavers are thicker compared to tiles and are the most frequently used travertine material used outdoors. They are 1.25″ and are commonly used for pools and outdoor flooring. What can you use travertine for? Travertine can be used for almost any project! From flooring to walls, countertops to backsplash, to the façade of your house to the walkway inside, the possibilities are endless! Travertine is also most commonly used for outdoor spaces, such as pools, walkways, and outdoor patios and kitchens. If you have a dream project, travertine can help you make it become a reality. What’s the difference between travertine, marble, and granite? Unlike marble and granite, travertine is less of a household name, despite its many uses, colors, sizes, and variations. Travertine is also more cost-effective due to how durable and long-lasting it is. One of the most notable differences is in appearance. Although all of these stones can be finished to feel smooth, travertine’s porous holes are what make it stand out. Another difference is the way travertine is formed. Travertine is formed in hot springs or limestone caves, granite and marble are formed by the crystallization of magma below the Earth’s surface. Why should I use travertine for my next project? For any remodel or building project, its important that the material you use is durable and long lasting – travertine is just that! It won’t fall apart, crack, or be destroyed by extreme temperatures and weather conditions. It’s also extremely easy to maintain, so you won’t be burdened with constant cleaning, which is great for installation inside. If you do need repairs, travertine is easy to fix and won’t require a long downtime for repairs.Travertine comes in several variations and sizes and can be constructed into any shape, which makes it versatile for any project. The colors and various finishes make it a great alternative to other stones. 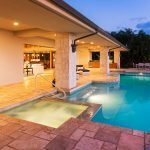 It’s also incredibly safe for a pool area, because the stone won’t get hot from scorching summer temperatures or freeze during the cold winter months. Due to its porous nature, it’s not slippery, which is perfect for children playing around the pool. What’s the difference between the different styles of travertine? Travertine comes in several different styles and depending on your project you may want to focus on one type of variation. Here are the main differences between pavers and tiles, split face or standard mosaics, and moldings and copings. Pavers vs. tiles: One of the biggest differences is the finish and the thickness. Pavers are generally a little bit rougher to the touch and have curved edges – tiles are smooth and have flat edges. Tiles are thinner at around ½ an inch or smaller. Pavers are cut in 1.25-inch thick blocks and are much thicker. Split Face or Standard Mosaics: Split face mosaics are tumbled to provide a rigid and rough exterior, with the highlight being the elevated pores of the stone, which gives an authenticity to your project. Standard mosaics are much smoother to the touch and are honed for a flat surface. Ideal for: Split face mosaics – backing for your fireplace, accent walls, the façade of an outdoor kitchen, the surface for spas and pools. 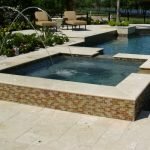 Moldings or Copings: Both moldings and coping have rounded edges and are used for the outer sides of a pool or another project such as a countertop. Travertine moldings frequently have several groves in the rounded part of the pieces and come in different styles. Travertine coping’s rounded edges are smooth and don’t feature any grooves. What is the French pattern of travertine? Although travertine rarely comes from France, a French pattern is so aptly named by a fixed size and pattern of travertine. The sizes are 8” x 8”, 8” x 16”, 16” x 16” and 16” x 24” and consists of 4 pieces. French pattern travertine stones are great for indoor or outdoor flooring. French pattern is also called “Ashlar” and “Versailles” depending on the location where the distribution center is located. What are the 3 main finishes of travertine? There are three main finishes of travertine: honed, tumbled, and polished. Each finish is based on the need and the look and feel you are aiming for in your design. Selecting the style you want is solely based on individualized preference. Honed: can be filled or not filled, has a smooth texture and is commonly put together by grinding one side of the stone so that it fits together. Do I need to seal the travertine I’m going to buy? Not all travertine you buy needs to be sealed. Sealing travertine allows for a smoother finish that brings out the natural color in the stone. Sealing travertine is also beneficial when you are using the material for flooring or on surfaces such as countertops, bathroom showers, and walls. It is smoother and nicer to touch and isn’t slippery when it gets wet. How do I clean travertine? Cleaning travertine is a fairly easy process, but is essential in order to get unnecessary dirt and stains off the surface. Maintenance is easy, but it’s important not to use bleach or products that are high in acidity. Use gentle cleansers with hot water and a microfiber rag for inside tiles. For outdoor surfaces, use a pressurized hose to remove dirt and debris. Make sure you remove any weeds or tall grass that may be growing through your outdoor travertine pavers because leaving them may cause the pavers to be destroyed or cracked. What are the colors of travertine? The color of travertine is made naturally based on region, surrounding temperature, and weather patterns of the travertine formation’s location, which is why the colors are compromised of different shades. Travertine becomes white, red, yellow, orange, and brown once the carbonate material aragonite is activated through extremely warm temperatures and precipitation. Travertine becomes the gray, white, and yellow, and sometimes green color from calcite, which is released in cooler temperatures where hot springs occur. Travertine is usually speckled with a range of darker to light colors with one primary color as the main focus. Why can’t I find the color of travertine that I decided on months ago? Unfortunately, every distributor names their travertine differently. You may be set on “coffee” colored travertine but can’t find it anywhere. Despite the name, at Faber we may name “coffee” “chocolate” so take pictures or show us exactly what you’re looking for, likely we have the same thing. I really want to start a remodeling project, but I don’t know where to begin. How can you help? At Texas Travertine we want to go above and beyond regular stone distribution sellers, we want to be with you each step of the way. That means, we provide consultations and will work with you to ensure that you get the best outcome for your project. It’s important to us that you’re happy, so let us help you go over any problems or concerns you may have. Everyone at Texas Travertine has expansive knowledge about travertine and remodels, so we can provide detailed help of how to turn your dream into a reality. 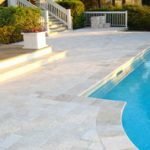 Is it easy to install travertine myself? Getting a professional to install your travertine may add to the cost, but may be worth it in the long run if you aren’t experienced. A professional contractor will know the right materials to use and how to use them correctly. In order to install travertine correctly, you must lay out the tile design in the exact pattern you want, mix mortar then set it, apply the tiles and place the spacers. If you have experience with remodeling projects or are eager to learn Faber CNK can help you along with this process. If you’re reluctant to do it yourself, we can help you find the best contractor in your area. I want to view the travertine before I buy it but I’m not located in Texas, what do I do? At Texas Travertine we can ship samples to you for viewing before you decide to purchase the material. Call us at: 832-831-7222 or fill out the form on our website: https://texastravertine.com/contact-us/, we will try to assess your needs quickly so you can get started building right away. If you’re located in Houston and want to check out the warehouse in person, feel free to visit us at 6500 Long Point Road, Houston, Texas, 77055. What is the minimum quantity of travertine I can buy from Texas Travertine? At Texas Travertine we do not have a minimum order we sell. You can buy as little as you want! What is the largest quantity of travertine I can buy from Texas Travertine? At Texas Travertine we don’t cap large orders of travertine but bulk orders do require a 4-6- weeks turnaround time. Custom orders are a little longer with 8-12 weeks turnaround time. In what part of the country does Texas Travertine deliver to? Texas Travertine is located in Houston, Texas so if you’re located in Houston or Texas and you want to pick up your travertine order yourself – that is the quickest option. Texas Travertine also delivers within all of the 50 states and ensures that the product won’t be damaged during transport. Everything is hand delivered in our trucks straight from our warehouse. We don’t outsource the delivery of our products. A Texas Travertine a certified driver will deliver everything directly to you. 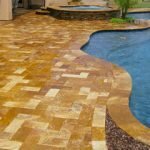 Although we have a 99% rate of delivering the product to you in the best condition, if your order was damaged during transport, Texas Travertine will reimburse you for the cost of the damaged travertine or replace the broken pieces. If the material is broken following delivery, Texas Travertine will not replace or reimburse you for the broken material, but will always fill another order to replace it. What do I do if my travertine has cracks or chips in it? Even if your tile or paver has a small chip or crack in it, the best thing to do is replace the entire tile or paver altogether. This is usually an easy process that doesn’t require the work of a contract, but you can of course have someone do it for you if you are worried about damaging the tiles or pavers. It’s easy to get a tile or paver that won’t stick out if you replace it. What makes Texas Travertine different from other stone distributors? Unlike other distributors in the United States, Texas Travertine is the only quarry direct distributor, which means we have our own quarries and are in constant communication with them. Other distributors are forced to go through a middleman to get the product, but at Texas Travertine we have 13 Turkish quarries of our own. This enables us to get high quality material directly from the source, which shortens the time it takes to get travertine, provides us with expansive resources, allows us to store travertine directly in our warehouse and eliminates unnecessary costs. What are Texas Travertine hours of operation and location? If you have any questions regarding our products or would like to view the travertine before you buy it, you can head to our office on 6500 Long Point Road #304 Houston, Texas 77055 or call us at: 832 831 7222. Our office hours are 8am-6pm M-F, Saturday from 9am – 4pm; we’re closed on Sundays. Feel free to fill out the form on our website for a quote on your purchase.